Nitra is a city in western Slovakia, situated at the foot of Zobor Mountain in the valley of the river Nitra. 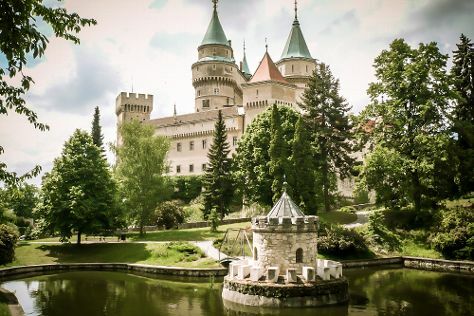 Change things up with these side-trips from Nitra: Bojnice (Bojnice Zoo & SNM - Bojnice Castle Museum), Banska Stiavnica (Open-Air Mining Museum (SMM), Old Castle Banska Stiavnica, & more), Trencin Castle (in Trencin) and Cerveny Kamen Castle (in Cerveny Kamen). There's more to do: step into the grandiose world of Nitra Castle and take in the architecture and atmosphere at Church of St. Michael the Archangel. To see where to stay, reviews, and other tourist information, refer to the Nitra vacation builder. The Route module can give you travel options from your home to Nitra. In October, daily temperatures in Nitra can reach 18°C, while at night they dip to 7°C.